Despite a 12-year absence from football’s premier global tournament, Poland heads to Russia this summer among the top eight seeds. Their elite position is evidence of the nation’s marked rise in international football (in 2013, Poland ranked 78th in the world; in 2018 it sits in seventh position). A quarterfinal run in France in 2016, in which the Eagles broke from group stages for the first time in 20 years, and striker Robert Lewandowski’s ascendance (he scored an all-time record 16 goals in qualifying for Russia) are just two of several performance highlights that coincide with a revived assurance around Polish prospects — forcing comparison to the golden generation of players who, in 1974 and 1982, claimed third-place finishes on the global stage. The red-trimmed, broken V neckline meets at the back of the neck with a breathable red tape featuring the Polish coat of arms. A balanced and talented group, including potential breakout stars Piotr Zielinski, Arkadiusz Milik and Karol Linetty, backs Lewandowski. 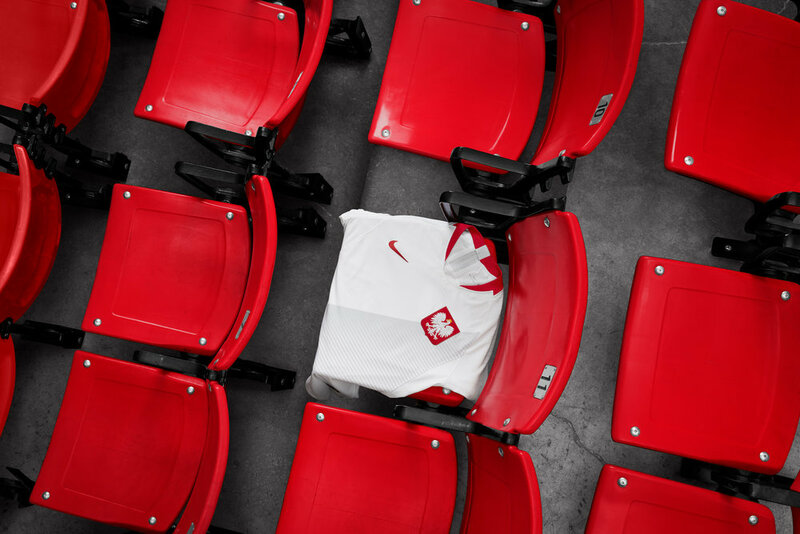 In Russia, they’ll wear a new collection that celebrates Poland’s potent attack and the fervent support that garners its players.